Below is an update from Dr. Mark Abney, UGA Peanut Entomologist. It will come as no surprise to anyone who has been walking through peanut and cotton fields over the last seven days, but tobacco thrips are still on the move. 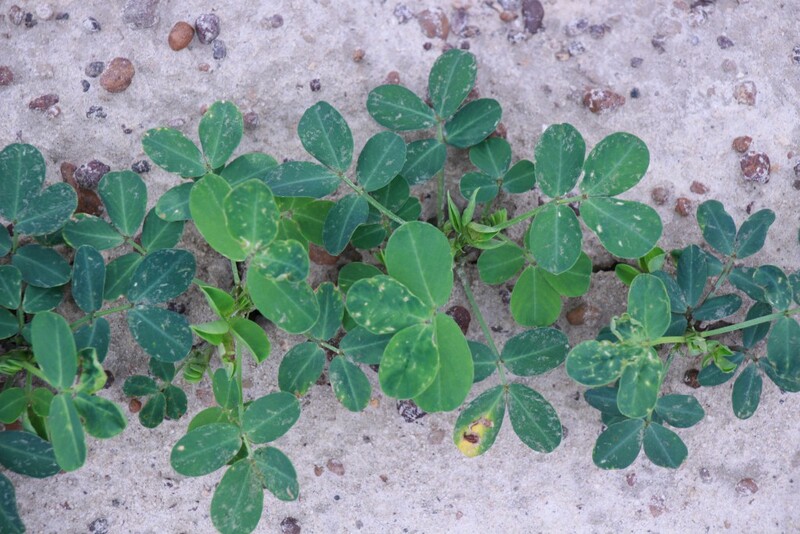 While there is no definitive answer to the question of when should we pull the trigger on a foliar insecticide treatment for thrips in peanut, here are some things to consider. If you are seeing a lot of adult thrips on seedling peanut and no at plant insecticide was used, it is time to spray. We could spend a lot of time debating about the perfect timing, and in theory it would be best to wait until you see immature stages before making a treatment. In the real world in 2016, there are probably already immature thrips in the field, and waiting to treat will just increase the amount of damage you are going to see next week. If we wait until after the terminals have turned brown to spray, we have not done ourselves any favors. The decision to over spray a field that was treated with an at-plant insecticide is not so easy. We almost always see some adult thrips in our plots regardless of the treatment; this is especially true while the thrips flight is active (as it has been for a couple weeks). So how do we know if those adults are going to die or survive and make more thrips? We do not know for certain, and that is why it is difficult to make a management decision. Thrips damage on untreated peanuts at 18 days after planting at the UGA Gibbs Farm in Tifton, GA. I rated my earliest planted thrips trial on Tuesday of this week (planted 29 April). Damage ratings in the untreated plots were similar to what I have seen in previous years during moderate to heavy thrips flights. With the number of adults and immature thrips I saw on Tuesday, I would expect damage to progress rapidly over the next seven days. In the attached picture of untreated peanut seedlings the terminals appear green and relatively healthy. Next week’s picture will probably tell a different story. 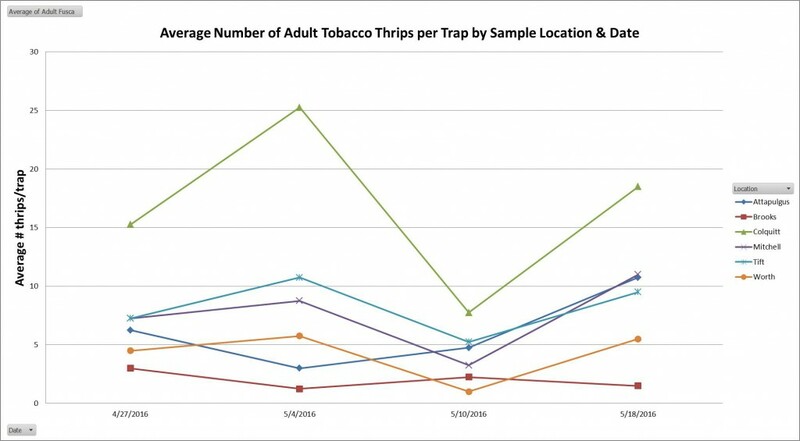 Trap captures of adult tobacco thrips were higher over the last seven days compared with the previous week. Today’s bottom line is that the thrips are here, and we need to be walking our fields checking for infestations and damage levels. Posted in Agriculture, Insects, Peanuts. This entry was tagged peanut, Thrips. Bookmark the permalink.